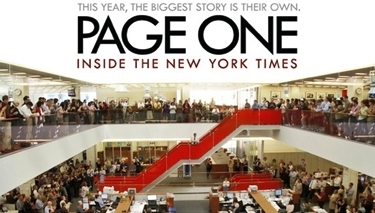 David Ross takes the occasion of the documentary “Page One: Inside the New York Times” (2011) to deliver a devastating critique of “the newspaper of record”‘s honesty, accuracy, prose style, quality of contributors, and exact place in the chain of biological phyla. Gail Collins, Maureen Dowd, Tom Friedman, Bob Herbert (recently departed), Nicholas Kristof, and Paul Krugman are the Bad News Bears of prose. Metal garbage cans tumbling down tenement stairwells are about as mellifluous. The newspaper industry has forgotten something it once knew: good journalism is a literary exercise. Read the whole thing (and don’t overlook the hilarious takedown of the ineffable Thomas Friedman he cites by Matt Taibbi). It is always tempting to fall into the mode of laudator temporis acti, but this is the same New York Temporis that published Walter Duranty’s denials of the existence of the Ukraine famine in the 1930s; the same newspaper which so thoroughly functioned as Fidel Castro’s publicist that wags responded to a Time’s employment advertising promotion of the 1960s by inserting pictures of Castro in the then-ubiquitous “I Got My Job Through the New York Times” posters; the same paper whose Sunday Magazine commemorated the sacrifice of 58,000 American lives the week of the final US withdrawal by publishing a picture of a contented North Vietnamese soldier, relaxing in a lawn chair (Kalashnikov across his lap, titled “The Blessed Peace;” and the same paper, which when news of the massacres of millions in Cambodia by the Khmer Rouge broke in the early 1980s, studiously ignored the story. The Times has always been a lying, propagandistic organ of leftism, and its cultural side has always been an intellectually dubious olla podrida of slavish trend worship, middlebrow establishmentarian cant, and cynical log-rolling. What Michiko Kakutani is to today, Bosley Crowther used to be a generation ago. I think David Ross is right: the Times has gone downhill in factual accuracy, editing, and prose, but in those respects I think the Times is simply mirroring the larger culture and reflecting a collapse of standards of education in secondary schools and prestige universities. What is different, though, today, I think, is the reckless and hysterical level of political partisanship. The Times used to be partisan, but it put the knife into its adversaries with discretion and a grave and carefully-maintained gentility. In those days, the Times and the liberal elite for whom it speaks, were unquestionably and unchallengeably on top and in American society’s driver’s seat. We live today in a post-Reagan revolutionary era, in which the status, authority, and even the economic position of the Times is seriously in doubt, so I suppose the Times’ increasingly thuggish behavior must be seen as a form of lashing out in frustration from the Fuerherbunker as it becomes increasingly evident that they are not winning in the end. One Feedback on "Reviewing the New York Times"
What is this New York Times about which you write?